This word cloud was generated from a job posting at CollegeGrad.com using a free online tool at JasonDavies.com/wordcloud. A word cloud is a graphical representation of a sample of written content. It varies the size of words within the cloud based on their frequency in the source, which in this case is a job posting. The job posting is, in most cases, a reflection of the employer's internal job description for the role. 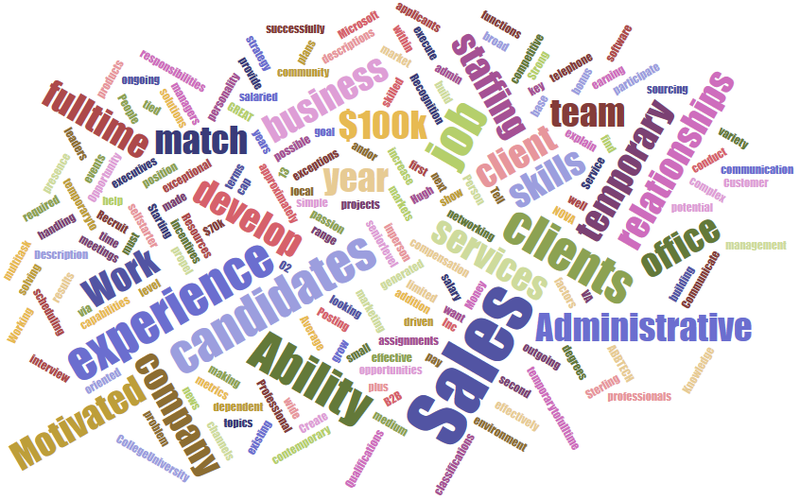 By placing the job posting into a word cloud, you can quickly see what is most important to the employer. This also gives you a concrete basis for customizing your resume to the job description to make sure your resume emphasizes the same wording. Now take your resume and run it through a word cloud generator. Your resume should have a similar emphasis when compared to the job posting for which you are applying. If not, you may need to adjust the emphasis and specific wording of your resume to properly reflect the job posting. Why does this work? Because the search for your resume is often based on the words, phrases and keywords found in the job posting. Making sure you have your resume aligned with the job posting will help to ensure it gets a view both visually and digitally once it is submitted. If you are going to take the time to apply, take the time to customize your application to the needs of the specific job posting. For more information on building out your resumes, please visit Entry Level Resumes at CollegeGrad.com.